George Inglis' last album, "Barstool Cowboy" was given a 4 star review in the world famous "Country Music People" magazine. The album is a big seller at gigs and the title track was made into a video which you can view at the Video page on this website. George landed his third Hotdisc British & Irish Number 1 single with "Children Of The 60s" following the title track and "The Man In Black" into the top position on the prestigious chart which is voted for by DJs and media people across Europe. There's a digital 30 track album, "Anthology," out now featuring songs from his past and some exclusive new cuts, as well as all the songs from the two albums he has recorded so far, "Barstool Cowboy" and "Land of Magic." George's 8 track e.p. features two mixes of the plug track, a new cajun tinged song he wrote called "The Old Time Rock n' Roll." There's also a video for the song filmed in the Scottish Borders. The song went to number 1 in the British & Irish Hotdisc Charts and you can see the video at the Video page. His latest singles are "I Am The Train", as featured in the movie "The Story of The Borders Railway," "Missing You", which is a track off the "Anthology" album, plus the latest single, the self-penned "Dear John (Lennon)." 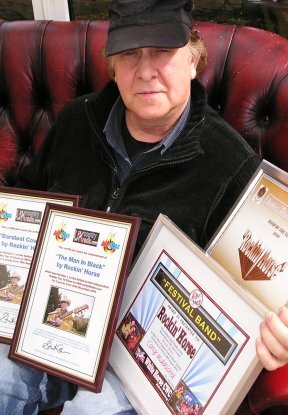 George has had six number 1 singles in all on the Hotdisc British & Irish Chart, with "Barstool Cowboy," "The Man In Black," "Children Of The 60s," "The Old Time Rock n' Roll," "I Am The Train," and "Missing You" all achieving the top spot in a chart voted on merit by European DJs who programme and play country music in the radio.